The Department of Homeland Security (DHS) inspector general’s office released a report this week detailing the inhumane conditions prevailing at the Adelanto Immigration and Customs Enforcement (ICE) Processing Center in California’s Mojave Desert. The report was the product of an unannounced visit by inspectors this past May, nearly one year after three deaths occurred within a three-month period at the facility. 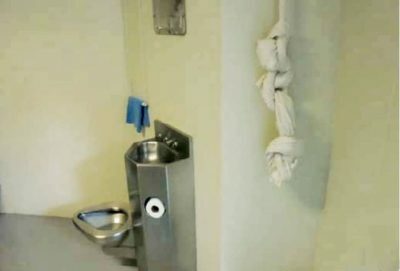 The report outlined numerous horrors, including denial of medical and dental care, the use of punishing confinement prior to conclusive rulings on allegations of inmate infractions and the terrible revelation that nooses fashioned out of bed sheets hung in at least 15 of the 20 inspected cells. “When we [DHS] asked two contract guards who oversaw the housing units why they did not remove the bed sheets, they echoed it was not a high priority,” the report states. The report noted that the guard escorting the inspectors through the facility had initially attempted to remove the nooses, but eventually stopped upon realizing how many there were. In March 2017, Osmar Epifanio Gonzalez-Gadba, 32, a Nicaraguan, was found hanging from bed sheets in his cell and later died on life support. Gonzalez-Gadba was facing his second deportation and had previously been deported in April 2016 to Nicaragua, the poorest country in Central America. Just days before Gonzalez-Gadba’s suicide, he reported having been sexually assaulted, but medical staff ignored his claim and never bothered examining him. At the ICE facility, inmates are subjected to daily physical, mental and sexual violence. As of August 2017, there had been at least five attempted suicides at the facility in less than one year, according to 911 calls. One detainee told inspectors he witnessed “a few attempted suicides using the braided sheets by the vents. … The guards laugh at them and call them ‘suicide failures’ once they are back from medical.” The callousness exhibited by ICE’s contract employees mimics that of Border Patrol agents, who tend to treat immigrants with ruthless inhumanity. Earlier this year, a report issued by humanitarian aid organizations found that border patrol agents had routinely destroyed at least 3,586 gallons of water and lifesaving aid along the border. Border patrol unofficially depends on the scorching heat of the Sonoran desert, which routinely exceeds 40°C (104°F), and often reaches 48°C (118°F), to whittle away groups of migrants whose survival often depends upon finding aid over the week-long journey. Adelanto is owned and operated by the GEO Group, which runs close to 50 private prisons and detention centers around the country. Adelanto was a state prison for adult males for nearly two decades, before it was purchased by GEO Group in 2010. Since then, tens of thousands of immigrant detainees have passed through the Adelanto facility. Some of them have been detained crossing the border, while others have lived in the US for years and decades before being swept up in ICE raids across the country. The report also indicated that there were numerous deaths that could have been prevented with proper medical care. Inmates are often denied medical and dental treatment, waiting on lists for months and sometimes years with reports of tooth rot and loss due to lack of care. One detainee reported multiple teeth falling out while waiting more than two years for cavities to be filled. A November 2011 review found that “medical officials were not conducting detainee health appraisals within 14 days of arrival” and included revelations that nurses without proper certification and training were performing health assessments. Many deaths, including that of detainee Fernando Dominguez Valdivia in March 2012, could have been prevented had it not been for “egregious errors” by medical staff according to ICE’s own Office of Detention Oversight. The Mexican national died of pneumonia, and was one of 141 people to die in ICE custody between 2003 and 2013, according to ICE. A 2015 report by the same body concluded that the death of Raul Ernesto Morales-Ramos was due to a lack of timely and comprehensive medical care when the 44-year-old Salvadoran man died from intestinal cancer that went untreated. Investigators also noted that detainees were improperly and prematurely placed in disciplinary segregation for alleged misbehavior, prior to any attempt to determine whether they had committed the alleged infractions. In addition, efforts were rarely made for translation or communication services for inmates to assist non-English speakers with an explanation of what was happening to them. Daily atrocities against immigrants, refugees, and asylum seekers are the status quo of Washington, DHS, the Border Patrol and ICE. The appalling revelations at Adelanto further underscore the reactionary Democratic Party-led political charade being conducted over the Kavanaugh hearings. The country is littered with private, for-profit prisons, supported by both parties. Where are the public hearings on the physical, sexual and mental abuses committed against immigrants, refugees and inmates alike across America’s vast prison system? No such abuses will ever make media headlines, as it does not serve the interests of the ruling elite as it carries out its reactionary in-fighting in the run-up to the November midterm elections.